This is the first of an occasional series of short news briefs relating to the geography of Mexico. This post focuses on three developments in Mexico City. In 2009, Federal District authorities introduced regulations aimed at forcing shopkeepers to avoid using any non-biodegradable plastic bags. However, the regulations could not be enforced until they included precise definitions of precisely which plastics are or are not biodegradable, and clarifying whether the regulations apply to supermarket packaging or only bags used by merchants at points-of-sale. However, some so-called biodegradable plastics may be no better for the environment than non-biodegradable bags, depending in part on the methods used for their disposal. Mexican scientists have recently developed a new corn-based form of plastic, suitable for biodegradable bags and most other plastic items. Hopefully, scientists and policy makers will eventually agree on the best way forward. 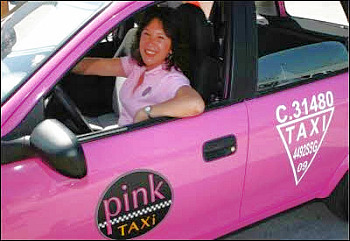 In September, several hundred, pink, female-only taxis were introduced to Mexico City. A limited number of female-only taxis had already been operating (since 2009) in the city of Puebla. The fares for users of pink taxis are identical to the fares for other taxis. Construction is about to get under way on extending the second tier above one of Mexico City’s busiest routes, the Periférico. The construction will eventually form part of an urban expressway crossing Mexico City from north to south, linking the existing highways to Cuernavaca, Toluca and Querétaro. At least some parts of the expressway, expected to be completed by 2012, will be toll routes. Creating special taxis exclusively for women sends the message that other services can’t be trusted. Instead, more needs to be done to screen and instruct prospective taxi drivers.